If you’ve been busy moving into your new home among Hamilton real estate or occupied with anything other than that TV screen for a while, you may be feeling overwhelmed with the remote in your hand, but this list will help you get some direction. The critics are saying HBO’s “Barry” is one of the best shows out there today and we agree. A “dramedy-thriller” starring Bill Hader as a hitman who accidentally winds up in an acting class and discovers he loves it despite being horrible at it, it offers the rare combination of hilarity, surprise and emotion all in one. Hader does dark comedy well and is an incredibly versatile protagonist while Henry Winkler, Stephen Root, Sarah Goldberg and Anthony Carrigan are a brilliant supporting cast. BBC America’s “Killing Eve” was one of the best new shows of 2018. A sleeper hit at first, it didn’t take long for word to spread about this action thriller starring Sandra Oh, one of the funniest women on TV. It’s based on a book series written by Luke Jennings but adapted for the screen by the genius behind two of the top British comedies in recent years, “Fleabag” and “Crashing” – Phoebe Waller-Bridge. Oh works in a London intelligence office and begins to obsessively hunt for a bizarre assassin played by Jodie Comer who leaves a trail of bodies across Europe. It’s hard to beat “Breaking Bad” but this spinoff may be even better. 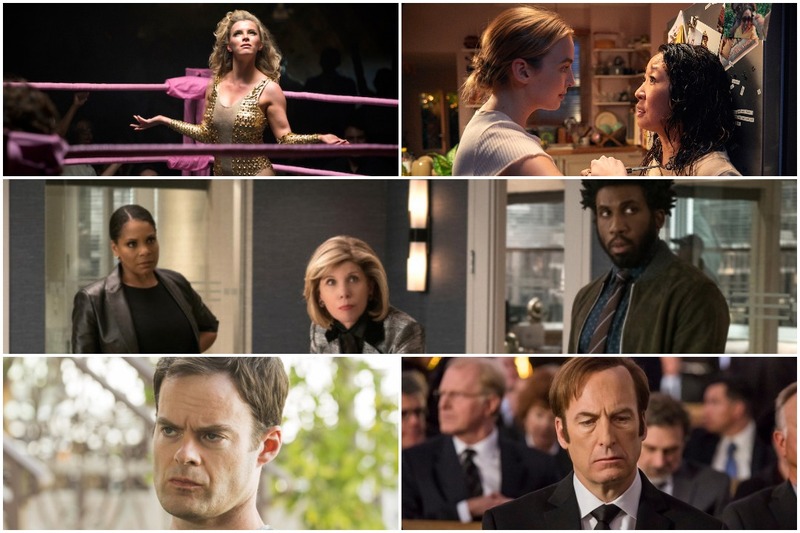 The fourth season, streaming on AMC streaming platforms, brought the show to outright tragedy and had some of the series’ very best moments in 2018. Saul is losing his soul in an endless attempt to escape his shadow. While it does many things well, there is one thing it does extremely well: it shows how not all criminals are cold-hearted members of a cartel who are willing to kill without giving it a second thought. Instead, they’re ridiculously dumb as they sing nursery rhymes while hiding out as fugitives. This CBS All Access drama is a spinoff of “The Good Wife” and is one of the few dramas on television that actually exists in the real world, complete with politics, scandals and a tweeting president. Its storylines tap today’s headlines from collusion to impeachment and the pee tape, leaning toward absurdity, just like it’s happening now yet it’s convincing enough that it doesn’t feel like a trope. This Netflix original show has been called the very best of 2018 by many critics. Starring Alison Brie and Betty Gilpin, it revolves around the Gorgeous Ladies of Wrestling, or GLOW, as a fictionalization of the gimmicks and characters from the 1980s syndicated women’s pro wrestling circuit. The series tackles topics like the #MeToo movement without making it feel forced, somewhat similar to shows where unlikely athletes pull together to beat the odds and win, but the situations and characters are more complicated.